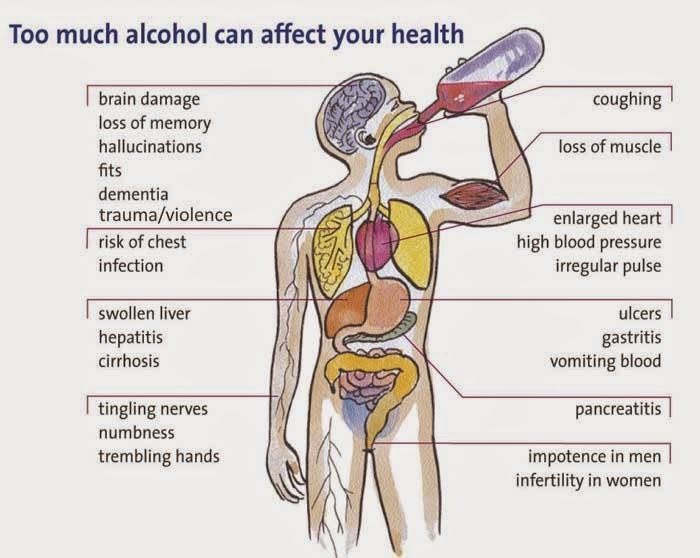 Following consumption, alcohol is immediately absorbed from the stomach and intestines into the blood stream and then transported to the brain and other organ. 🔶When alcohol diffuses into the tissue of the liver, it is oxidized by the cells, resulting into a series of physiological changes. 🔶First oxidation produces heat, which increases blood temperature. This stimulate the brain to increase circulation to the skin, resulting in a decrease in blood flow to the internal organs. 🔶When alcohol enters the Control centers of the brain, coordination is impaired speech may become slurred. * Increase perspiration as a response to the rise in blood temperature at the skin surface. 🔶Water in the kidney is reabsorbed to compensate for the loss of water through the skin. As a result nitrogenous waste collect in the kidneys, interfering with the normal filtration and secretion process. 🔶The severity of these effects depends largely on blood alcohol concentration ( BAC), a measurement of the amount of alcohol in the blood. Alcoholism is the disease of being addicted to the depressing effect of ethanol. 🔻long-term use of alcohol damages the body. People who consume alcohol in large amount and over large period of time may be more likely then non users to suffer from high blood pressure and some forms of heart disease. 🔽Excessive alcohol use can irritate the lining of the stomach a condition called gastritis, and eventually can lead to stomach ulcers. 🔽In some individuals, alcohol take the place of nutritious food, causing metabolic disorders. 🔻Chronic alcohol use forces the liver to use alcohol as energy source instead of relying on fatty acids. 🔽Eventually liver cell are unable to function properly and they accumulate fat deposits. As a result the liver begin to inflame, causing fatty liver, a condition that occur in 75% of all alcoholics. 🔽If the drinker abstain from alcohol, the liver can usually return to normal functioning. If drinking continues, the drinker may develop alcoholic hepatitis, an inflammation of the liver, or even cirrhosis, a condition in which normal 🔽liver tissue are replaced by scars tissue. Cirrhosis result in severe impairment of liver function and can be fatal. 🔻Children born to women who drink during pregnancy may suffer from fatal alcohol syndrome (FAS), a condition that can cause physical and mental disabilities. 2 ------------------ 0.05 to 0.06 ---- increase feeling of relaxation; slight lack of coordination. 3 ------------------ 0.08 to 0.09 ------- loss of coordination; light headiness,slight trouble talking and thinking. 4 ---------------- 0.11 to 0.12 ------- Decrease reaction; lack of judgement and other mental abilities. 5 ----------------- 0.14 to 0.15 ------- slurred speech; blurred vision,lack of motor control, impaired judgment and thinking. 7 ---------------------- 0.20. --------- mental confusion; loss of motor control. 17 ------------------------- 0.50 ----- deep coma likely. I love you but God love you best. I can not take it why addicts avoid these harms. I am doing a research on How long does alcohol stay in your system and harms it. I am going to add all these info in my research. Thank.